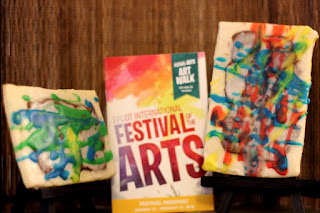 The Epcot International Festival of the Arts is in full swing and, as is the case with all the Epcot festivals, there is a fair amount of food to partake in. With the International Festival of the Arts being one of the shortest festivals on the calendar, many of us don’t get to visit the fledgling festival. That doesn’t mean that we won’t be able to sample some of the dishes in a home version. For instance, earlier this month D23 released a recipe for the beautiful Pop’t Art dessert. We were so inspired that we decided to try our own hand at baking up a batch of these beauties. First things first, the recipe is for the 2017 version, not the 2018 version. Based upon menus, the only difference seems to be in the filling as 2017 menu lists hazelnut spread and 2018 describes the dessert as having a strawberry filling. Feel free to substitute the filling as you see fit. Also, this is not a clean process, which makes it great for having children help with, so have enough place to make a mess and to have some fun when making these up! Cream the sugar and butter in the bowl of an electric mixer fitted with a paddle attachment until fluffy. Add egg white and beat for 1 minute. Cut into six, 3x5-inch rectangles. Spread 1 tablespoon of chocolate hazelnut spread on each cookie, leaving a boarder of about 1/8-inch around the edges of each cookie. 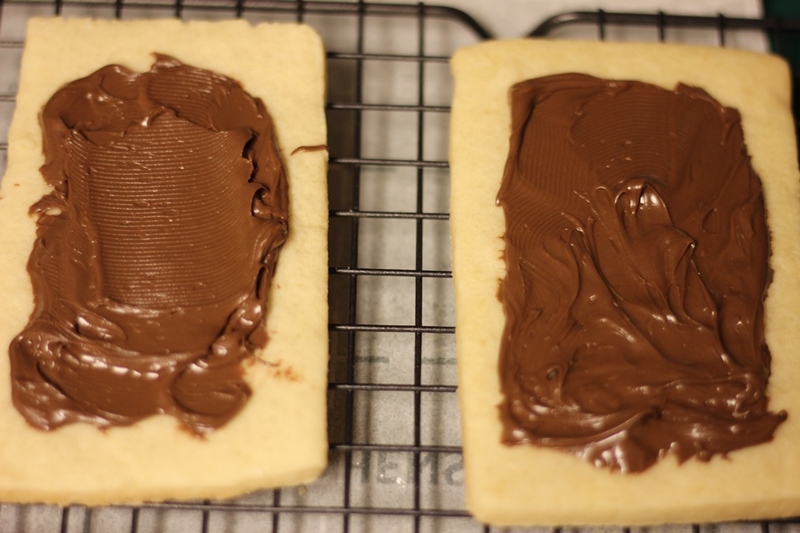 Dip each cookie, chocolate-hazelnut side down, into the glaze (directions below) to cover the chocolate. Once dry, use a fork to drizzle colored glaze on top of cookies. Let dry on wire rack. Whisk powdered sugar, 3 tablespoons of the milk, and the vanilla extract in a pie plate until smooth. Add additional milk if the glaze is too thick. With remaining glaze, mix with desired colors of food coloring to make decorative color. The glaze is good, but I would recommend making the glaze and decorative colors at separate times as the decorative portion will start to dry and harden during the glazing process. I would also make extra as we ended up scraping the bottom of the bowls to decorate. You’ll notice that some of the chocolate-hazelnut spread starts to drip into glaze, so the faster you can move at this point the better! Last, but certainly not least, use a variety of tools to decorate. We started with forks, but moved our way on to toothpicks, skewers, and a pastry brush. I’ll be the first to admit our final works looked less like a masterpiece and more like finger-painting preschool art time, but it doesn’t change that the Pop’t Art treats are delicious. This is a very simple recipe to follow, making it perfect for a family activity or a talking point for a party. 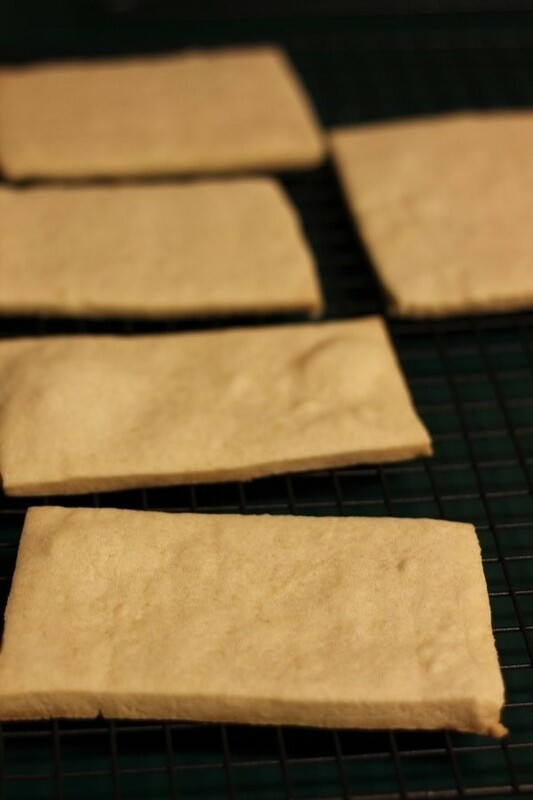 The sugar cookie itself is great and we’ll likely use it as our new go to sugar cookie recipe. Oh, and if you’re looking for small easels to display your masterpieces of culinary art, Michaels and Amazon have several miniature varieties for you to grab.